You might be surprised to learn that infrared horse blankets are very popular among some horse owners thanks to their therapeutic effects in relation to injury treatment and prevention. Elsewhere on this site, we've discussed the many therapeutic benefits of infrared therapy for humans. We've talked about the ability of infrared sauna sessions to help detoxify the body, treat obesity by aiding weight loss, alleviate muscular aches and pains, lower high blood pressure, boost the immune system and even help with the symptoms of Lyme disease. We've also talked about just how restful and relaxing the deep, penetrating heat of infrared sauna sessions can be, for both the mind and the body. And, we've pointed out that infrared therapy is completely safe, so just about anyone can enjoy its benefits. What we haven't talked about yet, however, is how infrared therapy can also be used to benefit horses. Many people aren't aware that infrared energy can be (and is) used for equine therapy. An assortment of infrared therapy equipment is used by knowledgeable horse owners and trainers to promote healing and accelerate rehabilitation after an injury, treat early-stage cases of lung bleeding, reduce lactic acid buildup in muscles, and give horses relief from pain caused by several health conditions, including arthritis, inflamed joints or tendons, pharyngitis, bucked shins, damaged suspensory ligaments and so forth. While any horse that's suffering from pain can probably benefit from infrared therapy, it is most often used on high-performance horses such as racehorses, hunters, show jumpers, polo ponies and steeplechasers. 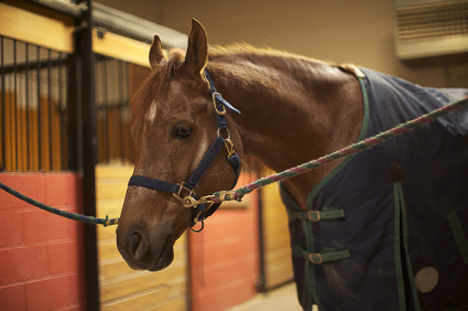 Most horse owners and trainers use infrared horse blankets to administer infrared therapy to their horses. Highly effective, these blankets are designed to treat the central core of a horse's body, providing the deep, penetrating heat of infrared to the horse's back, loins, withers, croup, shoulders, thighs, barrel and chest by means of several infrared pads that are strategically distributed throughout the blanket. Unlike conventional hot packs or heating pads that merely heat the surface of a horse's skin (and can potentially burn or irritate the skin), the blankets safely deliver heat that penetrates to where it's needed - into the muscles and other tissues beneath the skin. And, infrared blankets deliver this healing heat without adverse side effects like skin irritation or burns. Infrared therapy provides its therapeutic effects because the deep, penetrating heat produced by the and other infrared delivery mechanisms stimulates a vasodilatory response which, in turn, increases blood flow into the targeted areas. This locally enhanced blood circulation delivers additional oxygen, nutrients, metabolites and other essential biochemical compounds to those targeted areas. The increased transport rate not only helps keep tissues healthy, it speeds the elimination of waste and toxic metabolic byproducts (such as lactic acid) and reduces tissue inflammation. One brand of infrared horse blanket even claims to stimulate a horse's hemoglobin production by more than 25%. It's important for both horse and owner to warm up thoroughly before beginning a workout. The blood flow into cold muscles is inadequate to provide the level of oxygenation, nutrients and ability to remove muscular toxins such as lactic acid that strenuous exercise requires. Warming up helps prevent muscular cramping and strain by increasing the blood flow and promoting muscular metabolism. So, in addition to its therapeutic benefits, equine infrared therapy can also be used to enhance the condition and performance of a healthy horse. For example, before a race, match, competition or strenuous workout, infrared horse blankets can be used to reduce lactic acid levels to prevent tying up (exertional rhabdomyolysis), help bleeders by acting as a diuretic, reduce sinus congestion, and give the respiratory system an overall boost. Because the heat they provide is pleasant and relaxing, infrared horse blankets can also be used to calm a horse that's being skittish. As you can see, horses would benefit substantially if their owners or trainers add infrared horse blankets to their tack rooms. Infrared horse blankets can be used to treat an existing condition, prevent problems and provide accelerated warm-ups for competitions and other events, but they can also be used as part of a horse's routine, daily care. The end result of using an infrared horse blanket is a horse that is not only healthier, but better able to live up to its potential. To the top of "infrared horse blankets"